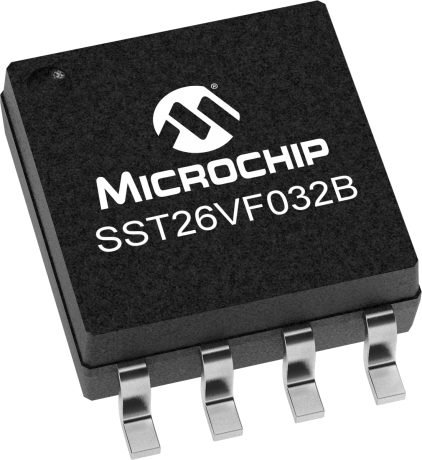 The SST26VF032B Serial Quad I/O (SQI) flash device utilizes a 4-bit multiplexed I/O serial interface to boost performance while maintaining the compact form factor of standard serial flash devices. SST26VF032B also support full command-set compatibility to traditional Serial Peripheral Interface (SPI) protocol. Operating at frequencies reaching 104 MHz, the SST26VF032B enables minimum latency execute-in-place (XIP) capability without the need for code shadowing on an SRAM. The device’s high performance and reliability make it the ideal choice for Network Appliance, DSL and Cable Modems, Wireless Lan, Computing, Digital TV, Smart Meter, Server, Set Top Box, Automotive and other Industrial applications. Further benefits are achieved with SST’s proprietary, high-performance CMOS SuperFlash® technology, which significantly improves performance and reliability, and lowers power consumption for high bandwidth, compact designs. The SST26VF032B default at power up is with WP# and HOLD pins enable and SIO2 and SIO3 pins disable allowing for SPI protocol operations without register configuration. The SST26VF032BA default at power up with WP# and HOLD pins disable and SIO2 and SIO3 pins enable allowing for Quad I/O operations without register configuration.